Title continued ''Presentation of Freedom''. 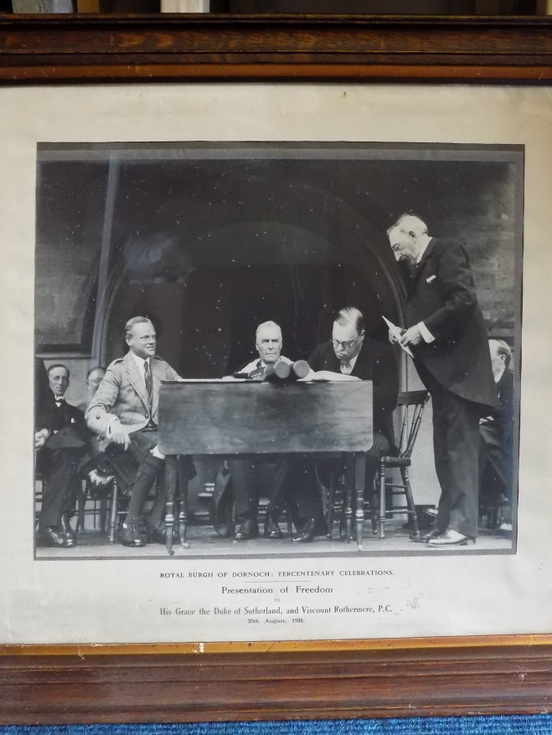 Framed monochrome photograph of the dias in front of the County Building Dornoch on the occasion of the Duke of Sutherland (seated left) and Lord Rothermere (signing the Freedom document) at the Dornoch Tercentary Celebrations Presentation of Freedom of the Burgh in 1928. The Provost John Murray is seated centre with John Sutherland, Town Clerk on the right. The photograph is mounted in a dark wood frame with an inscription below the photograph "Royal Burgh of Dornoch Tercentary Celebrations, Presentation of Freedom, to His Grace the Duke of Sutherland and Viscount Rothmore, P.C, 29th August 1928"